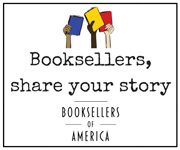 Being an independent bookstore in today’s retail environment means working tirelessly to stay connected with your community while also promoting yourself online as an alternative to other online retailers. All independent retailers, not just booksellers, are meeting this challenge in various ways. Come to this session to hear from Albuquerque’s independent retailer stars, ask questions, and discover ideas to apply to your bookstore.